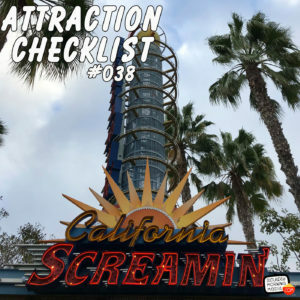 http://www.attractionchecklist.com – Let’s take one last loop on Disney California Adventure’s California Screamin’ before it gets its incredible makeover. Recorded on November 26, 2017. Today we take a ride on an attraction that will soon get an incredible makeover. Disney California Adventure’s California Screamin’. The guide map describes California Screamin’ by saying, “Zoom on this high speed coaster.” The Thrill level of this attraction calls it a Thrill Ride with big drops that is loud. Guests must be 48” or taller to ride and both FastPass and a Single Rider line are available for this ride. Before we Hurry, Hurry, Hurry to our seats, here are five fast facts about California Screamin’ at Disney California Adventure. 1. California Screamin’ is one of Disney California Adventure’s opening Day attractions, beginning operation on February 8, 2001. 2. The attraction uses linear induction motor to launch the coaster cars up the first hill. Guests go from zero to 55 Miles Per Hour in about four seconds at the beginning. This is also the only attraction at Disneyland resort that features a loop or inversion. 3. With over 6000 feet of track, California Screamin’ is currently the third longest steel roller coaster on the American Continents and the seventh longest steel coaster in the world. 5. California Screamin’ is set to have it’s final ride on January 8, 2017 so that it can be retimes as the Incredicoaster based on the Disney/Pixar Incredibles film franchise. So let’s take one last loop on California Screamin’ as it is today. Along for the ride is Suzie and after we’ll discuss our thoughts on this classic ride. This is a binaural recording, so if you have headphones put them on now as we experience Disney California Adventure’s California Screamin’! ← Grant’s Advent Calendar 2017 – Day #24 – CHRISTMAS EVE!